Beautiful Incentives: #ManicureMonday, #NOTD - Color Frenzy & In a NY Color Minute. #ManicureMonday, #NOTD - Color Frenzy & In a NY Color Minute. I was provided with samples to facilitate a review. All opinions are always 100% my own. NYC Color has come out with a new line of nail polish called In a New York Color Minute and the colors are really up my fashion alley. 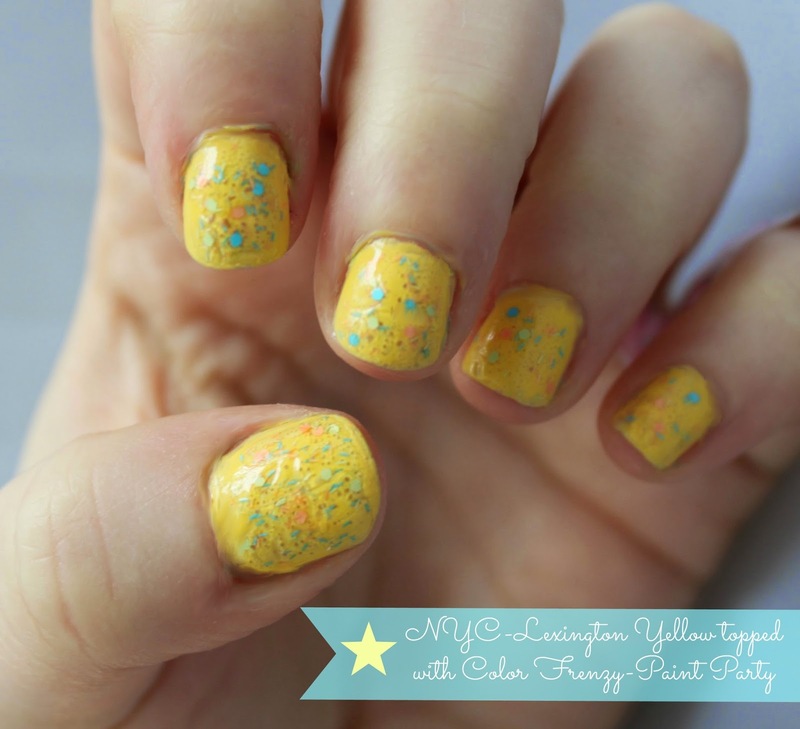 In addition, Sally Hansen has come out with Color Frenzy, a line of amazing confetti and sparkle top coats. The both go together like they were meant to be. 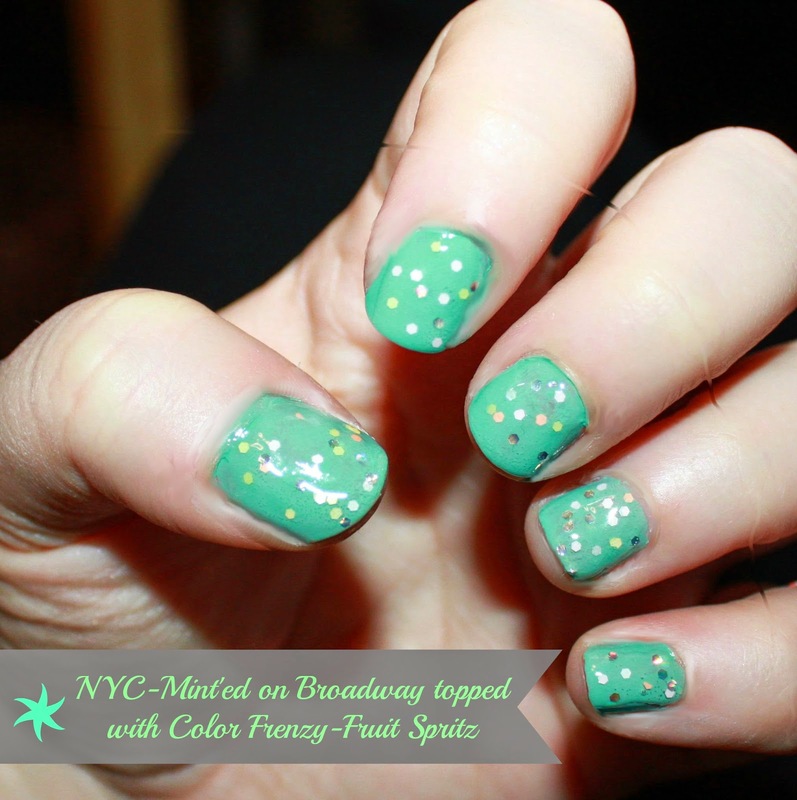 First up is NYC Mint'ed on Broadway, topped with Color Frenzy, in Fruit Spritz. The circular confetti is not too small or big and have a sort of reflective effect in the colors. The colors are yellow green and silver. All of Color Frenzy colors really sparkle in the light. I thought these two went well together. Second up in the NY collection is the Lexington yellow. It's vibrant and resembles the color of bananas. The Color Frenzy in Paint Party on top went really with this color. Paint Party is similar to Fruit Frenzy, only it has different colors and added sparkle and straight line confetti. I think the turquoise, yellow and orange go really cute together. 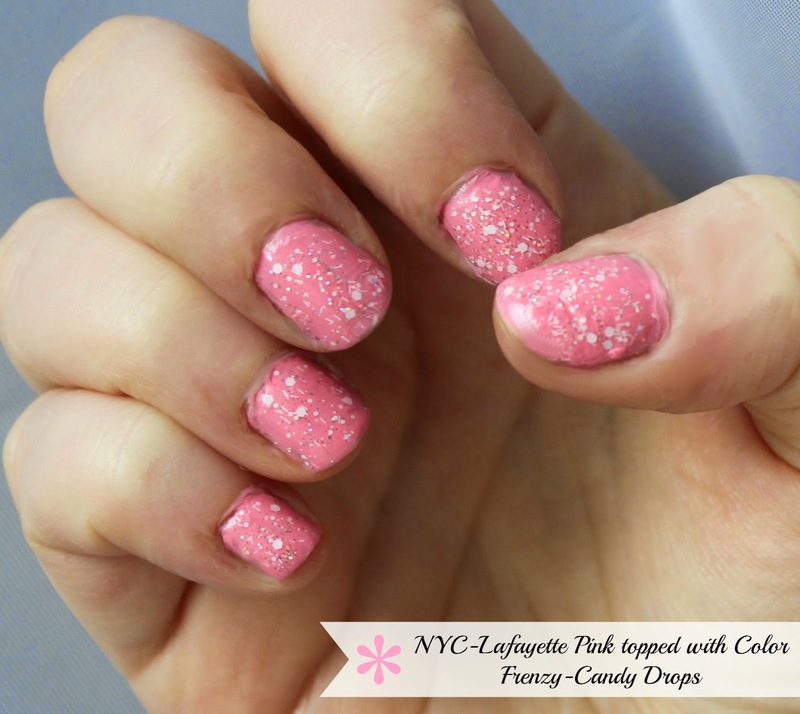 Next up is the NYC Lafayette Pink. It is such a cute baby pink meets mauve type of color and the Color Frenzy in Candy Drops went so well with it. Candy Drops is full of fine glitter and iridescent confetti, both large and small and gives off a rainbow silver sparkle. 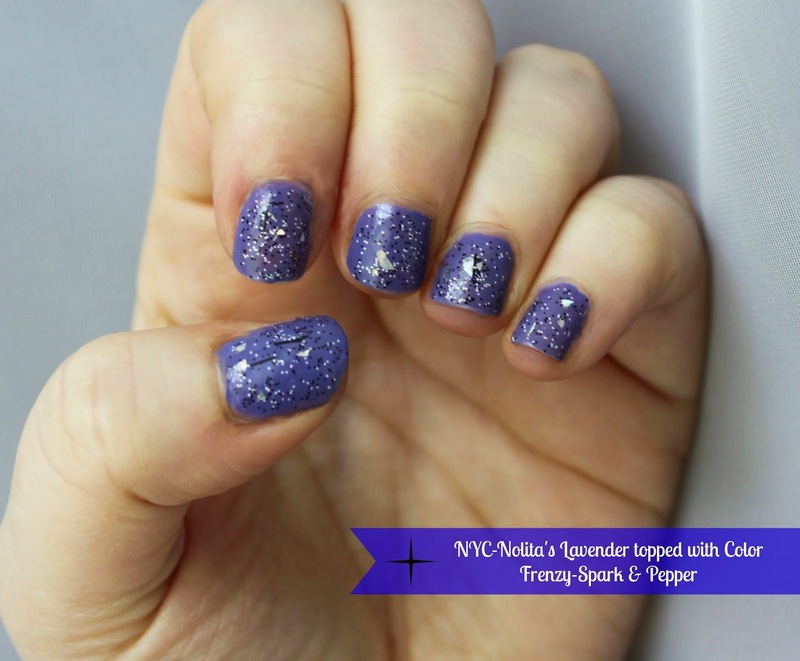 Lastly is the NYC Nolita's Lavender and the Color Frenzy in Spark and Pepper. It's a very pretty medium violet/lavender color and Spark & Pepper has a lovely smattering of black and silver sparkles. With chunky lines and asymmetrical confetti pieces. This pair look very celestial. Almost like the sparkles are going to float out and become part of the stars. All these colors took about 3 coats to get the desired look. I'm really loving the effects of these Color Frenzy top coats and The In a New York Color Minute has a huge variety of color, but never a huge price to go with it.